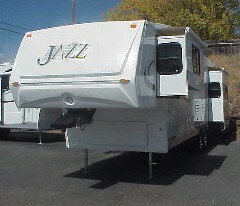 Residential living at its best in a fifth wheel trailer. Opposing sliders in the rear open living area and another for the bedroom King bed. Let's start at the rear with the near 14 foot wide living/family room. There's a sofa bed on one side and a booth type convertible dinette on the opposite side. The table removes to open a full 76" bed bringing sleeping capacity to six. All slides have windows with day and night shades. Across the rear from floor to ceiling is the optional fireplace with Home Entertainment System and 32" LCD TV. It's beautiful! The large center galley affords bar stools at the counter as well. Grab your drink, turn around and join the family room atmosphere. There's plenty of room to enter from outside and moving from front to rear without disturbing the kitchen. And with the galley across from the main entrance it's easy to unpack from shopping. Everything's central including the ducted A/C. Moving forward and up a step is the unique rounded hall to the upper deck. Wow, a windowed slide with a King bed. Mirrored wardrobe stretches across the front. And there's a wide vanity with a window at the foot. Plus, a wall mounted flat screen TV to enjoy. 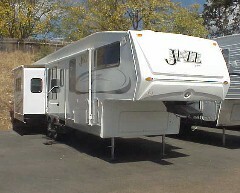 A complete enclosed bath is afforded by this unique platformed mid profile Fifth Wheel. Unique sliding wood doors with opaque glass close off the sleeping area making the bath accessible to the rear living area.